Fleetpoint is one of the leading MOT testing stations in Ayrshire, with all the latest equipment which is regularly calibrated and maintained within the guidelines of Vehicle and Operator Services Agency, which is the main governing body for MOT testing, you can be sure of a first class service when it comes to MOT testing your vehicle. 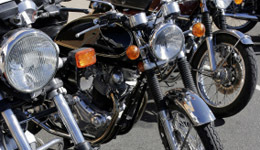 We have two testing lanes and a separate building dedicated for MOT testing of motorcycles, no appointment is necessary, although we recommend that you call first to be sure that we can test your vehicle promptly. Whilst you are waiting, there are comfortable and modern viewing areas with complimentary tea and coffee available. MOT tests are available 8.30am till 5.30pm Monday - Friday and 8.30am till 12.30pm Saturday. With our 28 foot pit we are one of few MOT stations in Ayrshire that can carry out MOT test for larger vehicles such as limousines, hearses and campervans. Each of our Nominated Testers has more than 30 years experience of vehicle maintenance, and you can be guaranteed that your vehicle will receive a high standard of work that meets your needs, and with all our employees fully insured you can have that little peace of mind should you require your vehicle to be collected or delivered to your door. At present we are able to MOT cars, vans, limousines, hearses, quads, minibuses, motorcycles and campervans, and hopefully in the near future trikes. We have a large customer base in Ayrshire and MOT bikes for the majority of local clubs - Hillbillies, Ayr Motorcycle Club, Loudoun Motorcycle Club to name a few and new customers are always more than welcome. If your vehicle should be unfortunate enough to fail its MOT test, there is no obligation for it to be repaired at our premises. A retest is free within ten days (VOSA conditions apply) whether it is repaired by us or not. Other than MOT testing we can also service your vehicle and carry out general repairs at customer request. Most recently purchased was the Verdict. Verdict is one of a kind. Verdict adopts open diagnostic technology, which is the most advanced in the world as well as the future of automotive diagnosis. 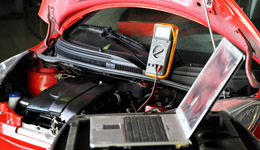 We also carry out fault finding for electronic parking brake faults specifically for Jaguar and Landrover and we are also able to repair them at a fraction of the cost of main dealer.